The ban does not apply to those using hands-free devices, and police say for the first few months warnings will be issued as people get used to the new law. GLENDALE, AZ — Glendale’s distracted driving law is now in effect, as of Thursday. Glendale city council members passed the ordinance at a meeting in January . The ordinance states you can be pulled over for using your phone, even if you're at a stop light. 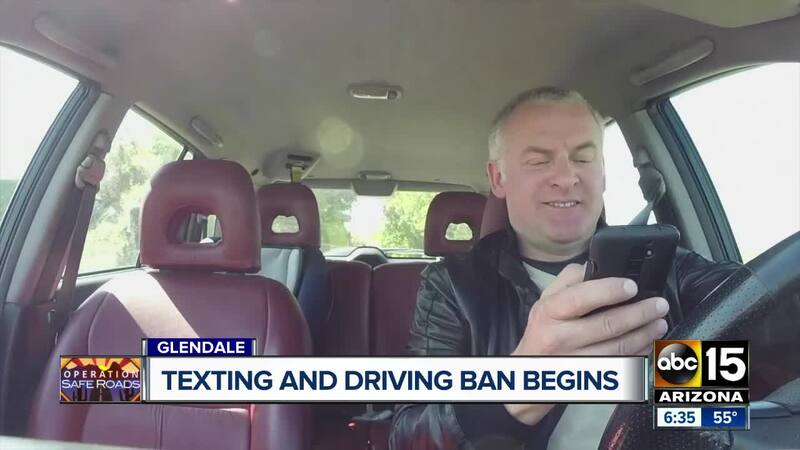 Police will be trained on the requirements and exceptions, which include calling 911 and whether you're in the process of switching to 'hands free mode' on a device. Arizona is one of only three states that do not currently have a statewide ban on texting and driving. Brendan Lyons, the Executive Director of the organization 'LOOK! Save a Life' came from Tucson to Glendale to show his support for the new Glendale law. He shared his story about being hit by a distracted driver while riding his bike. "I come to these meetings from all around the state to utilize my voice because all too often I meet families who no longer have their loved ones with them because of something that was completely preventable," he said. If caught using your phone behind the wheel, you could face a fine of up to $250. However, police say their goal is to educate people about the dangers of distracted driving, not just to hand out tickets.